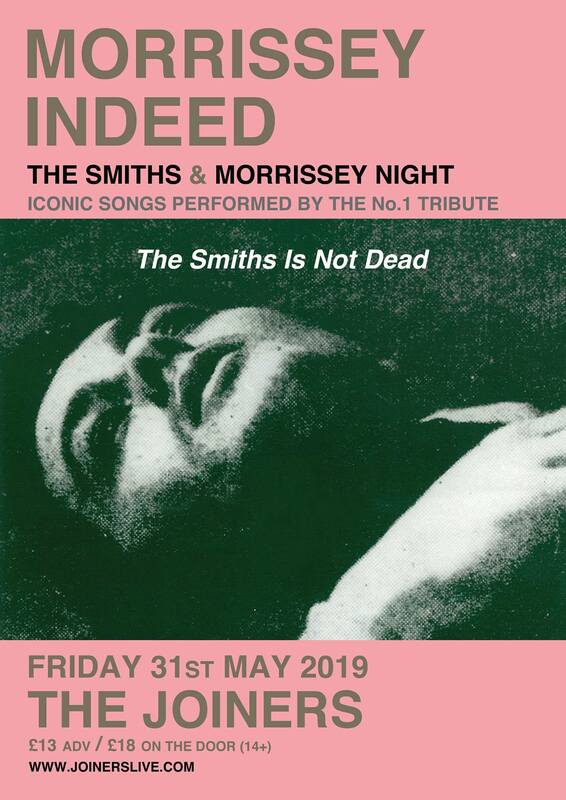 Morrissey Indeed are a tribute band to The Smiths and Morrissey, one of the most influential bands of all time and ‘the Real and Proper Poet Laureate’. They play the classic hits of The Smiths and Morrissey. Whatever happens – the allure of The Smiths and Morrissey will always remain, as the recent excitement around the rerelease of The Queen Is Dead and the Morrissey biopic England Is Mine shows. Morrissey Indeed transport their audience to the glorious and overwhelming live music atmosphere of the 1980s and beyond recreating the resounding words and sweet melancholy melodies of the Songs That Saved Your Life, from This Charming Man, Panic and There Is A Light That Never Goes Out to Suedehead, Everyday Is Like Sunday and First Of The Gang To Die. Whoever was lucky enough to experience The Smiths in the 1980s, and Morrissey in the 1990s, will savour the sweet taste of nostalgia with Morrissey Indeed. Those who did not have the chance back then, now have the opportunity to time travel to an era where live music mattered more than life. As a founding member of the critically acclaimed UK tribute band The Smiths Indeed, frontman and Morrissey-aficionado Jürgen Wendelen has been charming & convincing Smiths and Morrissey fans worldwide between 2005 and 2017 from Manchester to New York, Los Angeles to London, via Dublin and Amsterdam, with thrilling and engaging live shows. In Morrissey Indeed, Jürgen has gathered a new group of outstanding musicians in Flanders to continue the celebration and expand the repertoire with the greatest songs of Morrissey as a solo artist. Their debut appearance in Antwerp was met with enthusiastic praise and was soon followed by highly anticipated concerts in Cologne and England. Morrissey Indeed play a long set of Morrissey and The Smiths classics powerfully, authentically, passionately. The light never goes out.